....I just can't get into their frozen dairy dessert. Let's dig in and see if we can figure out why. 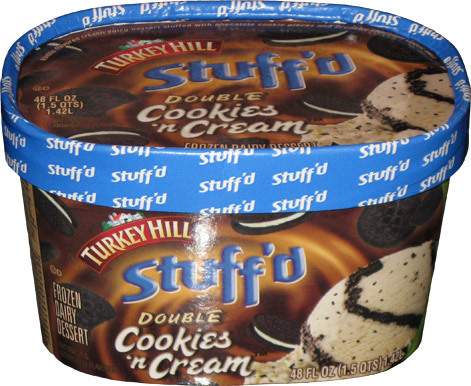 Turkey Hill Stuff'd DOUBLE Cookies 'n Cream. How can you go wrong with a name like that? It's vanilla frozen dairy dessert stuffed with chocolate cookie pieces and crunchy chocolate cookie swirl. 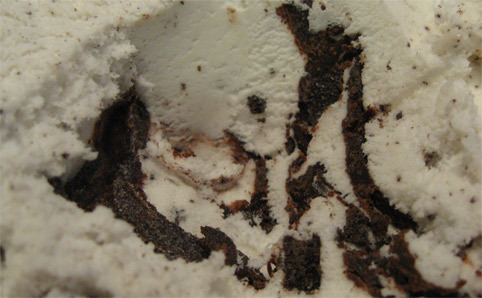 That's right, cookie swirl, which sounds like the fantastic swirl found in Turkey Hill's light Extreme Cookies 'n Cream. Do I need to describe how excited I was when I saw this flavor? Well, that's pretty close to the picture on the container. It looks like it should be tasty enough. Let's take a nice close look at the swirl before we get started. Sure looks like the same swirl I loved before. Oh but I was wrong. Something is wrong with this ice cream and I just can't get myself to accept it. You know, even my daughter didn't finish her bowl and that never happens. Sure she ate 95% of it, but she's usually clanging her spoon for a good five minutes getting every last bit of ice cream out of her bowl and she didn't do that this time. I wish I knew fancy words and terms and descriptions, but I don't, so we're going to call it funk. This ice cream has a funk and it's bugging me big time. One thing that is strange is the ingredient list: Milk, Cookie Swirl, Corn Syrup, Cookies, Sugar, Maltodextrin, Whey, Cream, blah blah blah. Is it just me, or does that seem weird? Maybe you could take it as a good sign that the cookie swirl is so prominent, I take it as something went horribly wrong. Sorry for being vague, but this one is a big fail for me. I'm not even going to both eating any more of it, it's that bad in my book. I've got one more container of Stuff'd downstairs, and if that's a fail, I give up on Stuff'd completely. They have plenty of other good products, so why bother. On Second Scoop (2014 Edition): I picked this up the other day and my wife and daughter have made very short work of the container, only leaving me about 5 bites for a second scoop. I was pretty harsh on this one, but it's only because I love cookies and cream so much. I just don't like the ultra soft texture and the underlying flavor borders on too sweet. On one hand there is this non-stop oreo flavoring to every bite, but to me it's just too much, it's too relentless and unbalanced. That all said, my daughter loved it and all the big cookie chunks in it. So take both opinions with a grain of salt and do what you must, but if you do it, try to do it on sale. I saw this in the store yesterday and was so excited! It was on sale so I bought it. You are so right about it; really strange. I blame the cookie swirl. Ice cream has to be pretty bad for me to throw it away! 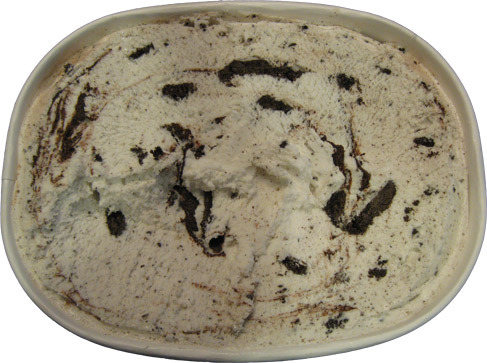 It's mind blowing that someone could mess up cookies and cream ice cream. It seems like they over did it with the cookie element. Simplicity can be a good thing. To me it tastes like a "frozen desert" and not ice cream. I won't say it is bad but none of these "frozen deserts" taste like they did or would have when I was younger. I feel like I am eating fake ice cream. ha, I like that! Indeed nothing from childhood was besmirched by such fake-ness. I think, I know the issue. There is no yummy cookie center in any of it. the bits of cookie are there, but the middle, which is my favorite part, is missing. I agree, the flavor is off, and I think its that.